For more than 20 years, I have been designing, developing, and managing enterprise business intelligence (BI) solutions. I love the intersection of mobile, analytics, and the cloud! And I have been fortunate to have been at the heart of digital transformation through mobile BI since the birth of smartphones and tablets. Specializing in executive mobile analytics, I help the C-suite drive growth and profitability with BI solutions. Whether managing or coaching junior developers, designing and coding myself, or implementing the actual solution, getting my hands dirty is critical to maintaining a growth mindset. The more we know about something; the more prone we become to, what I call, “intuitive bias.” It can turn our expertise and experience into perceived knowledge and resurface them in a form that can be both restrictive in forward-thinking and narrow in depth and angle. Subject-matter expertise is a critical multiplier of innovation and essential for collective insight. But its strength lies in the application of the empathy principle from design thinking: the desire to seek realization and perceptiveness in the experience—not accumulated experience confined to raw knowledge. Customer-centric design is about looking out from the inside, not outside-in. We can’t do that from behind a desk. Instead, we need to be in the trenches—working, observing, and, more importantly, suffering side by side with users and developers within their authentic circles and under realistic conditions. Only then do we have a chance to live the experience, rather than experience it in a distant light. 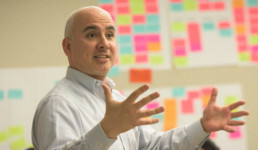 Whether designing enterprise solutions or guiding organizations as they develop a successful technology strategy, I lead as a catalyst to help cross-functional teams establish effective frameworks for delivering customer-centric solutions that are built on the principles of design thinking. By going beyond the edge of traditional roles and combining the potential of separate functions such as presales, sales, and marketing, I seek to define a bold vision and translate it into a well-defined, holistic strategy with a sharp focus, executable parts, and measurable milestones. If innovation is about creating new things, whether we are delivering completely new solutions or improvements in existing ones, then we must continuously chase the spark that recoils the energy needed to actualize these ideas and harness unrealized value. I satisfy this yearning by collaborating with R&D and product teams to convert new and old ideas into opportunities for generating value in cutting-edge technology solutions. I help them stretch old ideas beyond their traditional boundaries and shape new perspectives that serve as a foundation for future expansion and innovation. It’s often assumed that innovation can only happen within the limits of our core competencies. This is not true. Innovation allows us to fertilize the depths of our knowledge across different domains and technologies. Many times, I seek innovative thinking in areas that extend beyond my primary interests, experiences, and expertise. All of my work comes together in my pursuit of thought leadership, which empowers me to reach larger audiences and inspire conversations that would have been otherwise lost or never started. Whether it’s writing articles, conducting research, authoring whitepapers, or giving presentations, I seek to generate excitement about topics that are relevant and timely. Through storytelling and live demonstrations, I enjoy articulating a distinct business value proposition to excite and educate receptive audiences and customers. Thought leadership helps me grow as an individual and learn more about my purpose, which is a reflection of both my passions and imperfections. I see it as an everlasting journey for growth that starts when an idea is kindled and doesn’t stop when the fruits of that idea are delivered. More important, it’s a journey that sheds light on my path—allowing me to seek what is yet to be discovered. Let’s chase perfection together, however elusive, not because we think we’ll ever be perfect, but because we believe it brings us closer to excellence in everything we are and ever hope to be. Connect with me on Twitter @KaanTurnali and LinkedIn.